I STRONGLY RECOMMEND THE WINDOWS VERSION! HTML5 version is crashing on deaths. The game is pretty straight forward. You have to direct the hero from the entry of the room to the exit all in one go. If he stops or is injured for any reason he is teleported all the way back to the start. The game is controlled purely with the mouse and I am not aware of any major bugs aside from some funky audio. There is only 15 levels but it kinda goes over some of the basic ideas I had for this. I am sure a much more creative level designer could do better than my sleep deprived self. Have fun. Web version behaves in a very... inconsistent manner typical of the html5 export. If you want to have a stable experience download the windows version. Otherwise just reload the game if it freezes in web export, the game automaticly saves if you clerared a prior level perfectly or not. Just use the level select menu to go back to where you were. I really enjoyed this one. The graphics are nice, the music is great, and the gameplay is neat. It was really interesting trying to set up a convoluted series of jumps and moves to reach, and very satisfying watching the knight bounce all around the level when I was finished. Unfortunately I had to give up on going for all the chests after a while as it was taking a long time and I wanted to move on. There's definitely a lot of potential here though. I like the jumping mechanics a lot. I wasn't so keen on the arrows and blocking as it seemed to require too much precise timing. After a few levels it became tremendously hard, I'm not sure it's even possible to get all the chests or even more than 2 chests, so I switched from "let's get all the chests" to "let's just finish this level" which is a shame because I found to be the most interesting part, was to try again and again to get all the chests or as many chests as possible. One possible solution would be to make it complex enough to just reach the end, this way even if you go "I don't care about the treasures" you still got some difficulty to overcome. I really liked this game. It's very polished and it plays nice. I spent quite some time playing it. :) Thankyou for taking the time to play through to that point. There are a few where getting all the chests is impossible due to mistakes on my part in the rush to ~finish~. Whenever I do return to this I hope I can actually think of some puzzles where simply finishing is challenging enough but I just could not in my sleep deprived state during the jam. Great music and fun game play, nice work! Really awesome idea! Great music and graphics! Some nice little visual indications of selecting a different puzzle piece would've been. Also i kept placing pieces onto the screen when i would select a new piece which never messed up what i was doing but just a minor annoyance. Took me a while to figure out the camera and the system. I think a basic camera follwing the player would have worked just as well, but it would allow less freedom. I would have benefited from a short tutorial. Really good game, loved the idea even though it doesn't connect with the theme at all, you executed it pretty well even though the start was really confusing, but with rules like these it's doomed to be. I liked this game, a fun little puzzler. Had some problems with the difficulty of the level where you had to cross two walls. The treasure counter seemed to either count the incorrect number of chests or didn't reset after resetting a level when you've already gotten a chest. I also found the camera a bit annoying, would have been nice with either more spacing or maybe controlled it some other way. 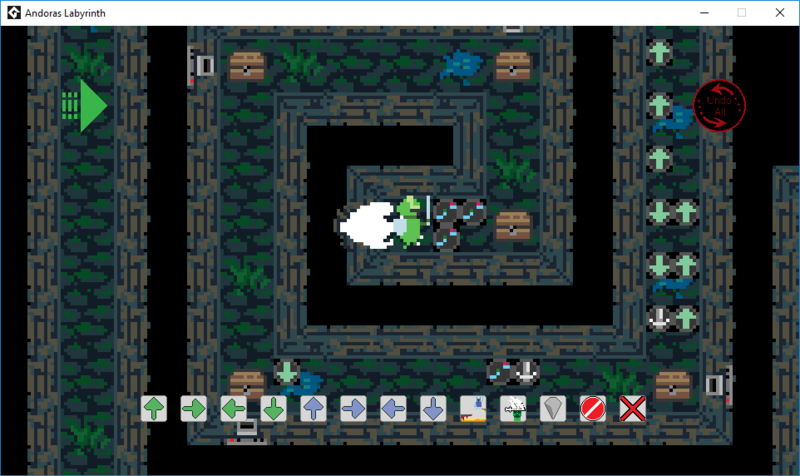 I also found myself often placing a incorrect arrow or marker when I was starting the run and also when clicking a button. I played every game in the jam and I felt this one was the most innovative. I'm really impressed with what you were able to accomplish! Not having hotkeys did feel really tedious, but with all the work you implemented I can see how that would be lower priority. It did bug out a bit on me by randomly placing icons. As others have mentioned the camera was an issue. Is it inspired by another game? I would love to play another game like this with a bit more polish. Well done! To be honest no, it is not really inspired by any one game. Maybe The Sims? Do you have any ideas on how the camera should be handled it is pretty much the most consistent bit of feedback and I think I may actually give this another go post-jam. I legitimately had fun once I got the system down and would get pumped at each new level, thinking I could get it on the first try. Music is great. It would definitely be nice to have more padding around the level so that you're less likely to activate the auto-scroll while clicking the icons at the bottom. Good job on this! I hate the camera system, but i also have huge difficulties playing dota and starcraft for the same reason. The music is jammin though and I like it a lot. I like this game.It's best browser game.Music sounds really magic.the concept is implemented at 100%. I love the tile sets, music is excellent, and the concept is great. I saw this yesterday when you posted it, and I was looking forward to checking it out. Im glad I did. The HTML5 version did lock up on my on the second level so I grabbed the download (as recommended) and it worked great. Im going to keep this on my desktop to mess around with once in a while. CONS: Same as some of the others. The mouse follow is slightly annoying, but it didn't take long to get use to it. Over all a great idea. It's a cool idea and a nice take on the theme. The art and music is very good too. Putting all the arrows and stuff down was a little bit more annonying than I thought it would be though :/, maybe it was the camera following the mouse all the time, this kinda pissed me off in level 1. I even lost sight of the stage itself, maybe put some boundaries around the walls. An innovative idea to move the player character. I had some troubles at first how the system works, but then I realized and got some puzzles ready. Awesome Game! Great gameplay but I could not figure out the levels where there was a wall between you and the exit. :D The trick is to jump the wall.